Here’s a mehndi artist from the land of temples, Tamilnadu who has been passionate about mehndi designs since her childhood days. As part of the series where Zuri introduces amazing mehndi design artists to everyone, toady, I cannot be happier in introducing this amazing mehndi design artist to you from Tamil Nadu! Tamilnadu is famous for kanjivaram silk sarees, monuments and traditional dance forms. In a small city called Tiruppur, is a gifted mehndi designs artist named Nihaad. Read on to find out more about her journey and to view her lovely mehndi designs. (In case if you’d like to see the other interviews with mehndi artists, click here, here, here, here, here, here, here and here). 1. Tell us about yourself – when did you begin applying mehndi and how did you think of getting into this line. 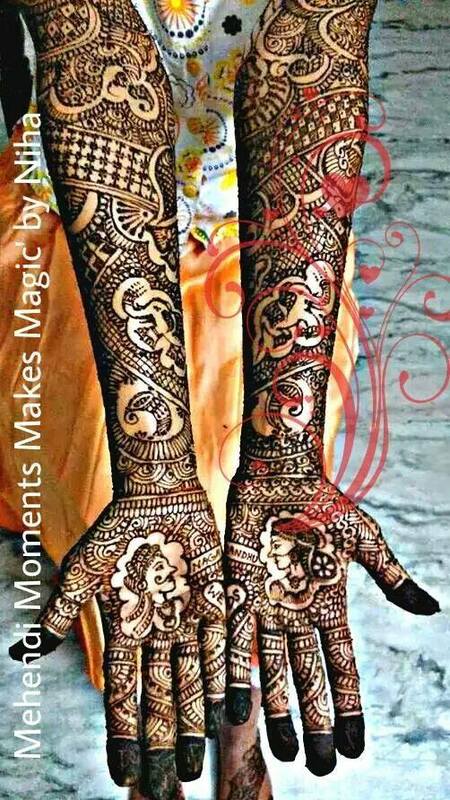 I am well know in this mehandi profession by the name of Niha and am from a small town called Tiruppur in Tamilnadu. From childhood I have been very passionate about mehndi and had started practicing on many people from my family to friends. After completing my M.A English literature, I thought I’d get into the teaching profession, but the opportunity of applying mehndi came knocking on my door and I grabbed it. First, I sought the help of some salons who linked me to their clients, and after people knew who I was, they began coming to me directly. I don’t like to repeat the same designs again and again, actually every time I do one design, it turns out to be different from the previous one, so I don’t follow any set rules or patterns. Sometimes the bride specifically asks for the the raja-rani( king and queen image) mehndi design, then I have to oblige. There is yet another design which is called spiral design or bangle type design, with little bit gaps between each layers of spirals which looks gorgeous. 3. What has been the most memorable experience you have had while doing mehndi designs – something that has stayed close to your heart and is remembered very fondly? There are 2 episodes that have taken place in my life so far that have been memorable for me – first was when I got a chance to speak on Radiocity 91.1 FM regarding my mehndi profession. Speaking for the first time on radio was a dream come true, and I was so happy and over whelmed, as this was the first time I was acknowledged as a mehndi artist. The second time was when I applied mehndi for a malayali bride, who wanted some specific and exquisite designs from the internet. I tried my best to replicate the design on her hands and feet, and the bride was thrilled to see the work I had done. Her entire family appreciated my work, and congratulated me on being extremely dedicated to my profession. Avoid water for 24 hours after your henna is done. It’s best to apply mehndi designs on dry hands than on skin that is moisturized. So before applying henna, keep your hands clean and free from any lotions or creams. Mehndi should be left overnight on the hands by wrapping it with toilet paper/kitchen towels to avoid the mehndi from falling off. In the morning, it should be scrapped off and coconut oil or ghee. The best way to reach me is through my Facebook page. 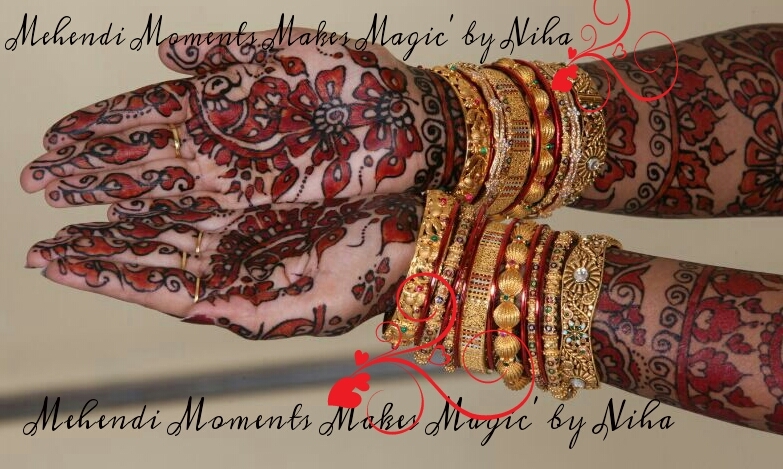 (Published with permission of Mehendi Moments Makes Magic’ by Niha. Please don’t use these images without permission from the original source).